Good morning, Lyndale! It’s a privilege to be with you, and I am especially grateful to my dear friends Rev. Ashley and Rev. Rebecca for the invitation to worship with you this morning. Now, it may seem a little counterintuitive, but as much as I have enjoyed hearing the prophetic words of Dr. King woven throughout the service today, I am NOT going to be preaching about Dr. King. Instead, I’m taking the advice of one of my colleagues, a Black Unitarian Universalist pastor named Rev. Kimberly Rochelle Hampton, who recently gave this piece of advice for white preachers on MLK Sunday: “Instead of preaching ABOUT King, preach about the things King would have preached about,” she writes. So in that vein, I thought I’d go for an easy topic: Reparations. And in case you’re wondering, I’m pretty sure Dr. King would approve of such a conversation, because there’s a rare clip of him in 1968, just before his assassination as he was preparing to lead the Poor People’s March, and after a long litany about why the country needs to make Reparations, he looks right at the camera and says, “Now, when we come to Washington in this Campaign, we are coming to get our check.” So hang on tight, everyone, because here we go. Let’s start with a story. On a January evening in 1865, twenty Black pastors made their way toward a grand mansion in Savannah, Georgiat. They were greeted by their hosts–the Union’s Secretary of War Edwin M. Stanton, and General William Tecumseh Sherman, who had only days before completed leading the Union army on their infamous March to the Sea. The General and the Secretary had invited the Ministers to come and speak on behalf of Southern Black people–especially those who had just been freed, and who were tagging along after the Union army without anywhere else to go in the hostile Confederate lands. What if the history of the United States had proceeded like this? What if not just 40,000–but all 4,000,000–formerly enslaved people living then had received land as a small, but real, recompense for the brutality they and their ancestors had endured? What if the government had also gone on to reverse its policies of Native genocide and land theft, repatriating land to displaced tribes or returning annexed Mexican land to indigenous peoples? Just imagine what our country might be like now… Would we have had a hundred years of Jim Crow laws? The plundering of the earth for mining and oil and pipelines? Would we still have a racial wealth divide, the school-to-prison pipeline, the highest proportion of incarcerated people in the developed world, appalling disparities in education and healthcare? It’s impossible to know, of course, because that isn’t what happened. It was only a few months after that short period that President Lincoln was assassinated. His successor, Andrew Johnson, quickly overturned Special Field Order No. 15, evicting the newly settled Black families and repatriating the land back to the elite white planter class. That is the first, and only, instance in American history of any kind of Reparations for slavery. “Reparations” is a loaded word in this country, no matter who you are. And let me be specific –I am talking about redistribution of land and wealth as a way of beginning to pay damages to people of color and Indigenous communities who have been systemically harmed by white supremacy. Ever since the US government reneged on Sherman’s order for “40 acres and a mule,” there have been only a handful of actual instances of reparations–the most notable being the Civil Liberties Act of 1988, when the government paid $20,000 to each surviving Japanese-American who had been interned during World War II. Largely, though, Reparations are a political non-starter, especially when they are specifically about compensating Black communities for the legacy of slavery. For the past 29 years, for instance, Rep. John Conyers has introduced Bill HR 40 — the Commission to Study and Develop Reparation Proposals for African-Americans Act. It has never once made it past committee. The topic of Reparations ebbs and flows in the public discourse every few decades, but it has never actually resulted in policy change. When it comes up, as it did again in 2014 in the wake of Ta Nehisi Coates’ seminal Atlantic article, “The Case for Reparations,” the conversation is predictable: someone lifts up the atrociously racist history of the United States, and calls for what Coates refers to as “a national reckoning that would lead to spiritual renewal.” And many people–people like us, probably–feel compelled and exhorted, and we say, YES, white supremacy is our national sin, and we should do something to repair the damage it has inflicted. But then, even those of us who are on board with the moral imperative for Reparations jump directly into the “how”, and we get stuck. Should the money go to individuals, or into community investments and programs? How do we trace lineage? Are we talking about Black people, or all people of color, or indigenous people? Would Reparations bankrupt the Federal Government? And on and on and on until it feels so sticky and impossible that we abandon the prospect entirely, once again. So because I was invited to come here and poke this particular hornet’s nest, I want to pause here and take a little more time with the spiritual reckoning part of the Reparations conversation. I went really old school with you this morning in my Scripture selection, didn’t I? Some nice fiery Hebrew Prophets–good ol’ Jeremiah. (As I said to Ashley this week, when this Unitarian Universalist gets to do Bible, I DO BIBLE!) Just stay with me here, though, because I promise we’re going somewhere. For context: Jeremiah lived as the Kingdom of Judah was under intense threat. He’s often known as “the Weeping Prophet,” because so much of his writing is lamentation over the sins of his people, moving further and further out of covenant with God. Jeremiah calls his people to repent, even as he predicts the fall of Judah into the hands of warring neighbors. That’s the backdrop as Jeremiah cries: “Act with justice and righteousness, and deliver from the hand of the oppressor anyone who has been robbed. And do no wrong or violence to the foreigner, the orphan, and the widow, or shed innocent blood in this place” (Jer. 22:3). If you don’t, he warns, the Lord will destroy the kingdom. Now, my own theology does not include a God who takes vengeance by decimating entire nations. But this scripture is meaningful because Jeremiah reminds us that the sin that leads a people to its downfall is not worshipping wrong or breaking dietary laws or getting tattoos, but collectively allowing inequity and injustice against marginalized people persist without correction. In the spirit of the Weeping Prophet, here’s my own lamentation: As we face irreversible climate change, volatile international politics, and broken policies within our country that threaten the lives of everyone except the whitest, malest, richest, most powerful among us… it feels to me on some days like our house–our country–our planet–may indeed become a desolation… not by the wrath of God, but by our own hand. That possibility feels very real, and very connected to the ways in which we are so radically out of right relationship with the Earth and our human siblings. But my hope lies in one tiny word in this passage. Jeremiah commands, “deliver from the hands of the oppressor anyone who has been robbed.” Anyone. Not everyone, but anyone. This tiny, three-syllable word reminds me that while I, and you, and this congregation, and my organization have very little power to radically shift the big picture, we each have the power to do what we can, where we are, with what we have. We each have the power to stop colluding with evil, and start–in a thousand tiny ways–healing this beautiful, broken world. But true healing–spiritual, emotional, material healing–of the wounds created by white supremacy, can only begin after we stop actively doing violence. Which is where Reparations come in. We cannot create a just and equitable society for all people until we stop the harm of generational wealth hoarding, stolen labor, and land theft from Black and brown and indigenous communities. Many of you know that I have the privilege to work closely with your pastors–especially Rev. Rebecca–through MARCH: Multifaith Anti-Racism, Change, & Healing. And one of the major projects that we’ve been scheming together over the past few years is exactly this kind of small-scale Reparations. We call it CommunityWell, and it’s incredibly simple: we know that progressive, predominantly white congregations in the Twin Cities have tremendous resources–people, infrastructure, money. And we also know that these congregations want to be of use in the movement to dismantle white supremacy and build a racially just society–but way too often, we have no idea how to begin. So, the premise of CommunityWell is to essentially be Reparations Matchmakers: we work with progressive white congregations mapping their assets, and then pair them with local organizers and activists from marginalized communities who need those resources to lead the work for justice. Small scale reparations in service of larger healing. For example, let’s say we get a call from Black Visions Collective that they need space to host a hundred-person organizing meeting and dinner; they’ll need a sound system, and flip chart paper, and a projector, and an industrial kitchen. CommunityWell says, “Well, hey! The congregations at Springhouse have all of this, and they’ve committed to make it available on short notice for free.” A phone call is made, bada-bing, bada-boom, and all things become possible. Or, an emerging group of undocumented migrants is coming together to organize against ICE down at the Whipple Building, and they need a fiscal sponsor to handle their donations–a CommunityWell congregation, using its 501(c)3 status, could step right in and make fiscal sponsorship free and easy. Or– imagine this–if every member of every Sanctuary congregation in the metro donated one extra dollar every week–literally change from people’s pockets–we’d have somewhere between $20-40k per month to give to Black, brown, and Native organizers who need to keep one of their core members from being evicted, or bail out protesters who’ve gotten arrested, or put up first and last month’s rent on their own office space. If just 10, or 20, or 100 congregations committed to radically sharing our resources–no strings attached–with the organizers and activists leading the charge for justice, what would become possible for our movements? And, just as importantly, how would our own souls be transformed? Committing to Reparations can feel messy, and threatening, and destabilizing. As we struggle to meet the church’s budget every year, and send offerings to a thousand worthy causes, it’s easy to convince ourselves that resources are scarce, not over-abundant. And yes, sharing our copiers and our 501(c)3 status and our church vans and our meeting spaces with Black and brown and native leaders who might never, ever worship with us entails risk, and loss of control, and a need for deep humility and trust. But without these kinds of small scale Reparations–stopping the harm by doing whatever we can to resource movements for justice–the Church will never be seen as trustworthy, or relevant, or useful. And, more importantly, healing will never begin. So–spoiler alert–this is not just an abstract conversation. 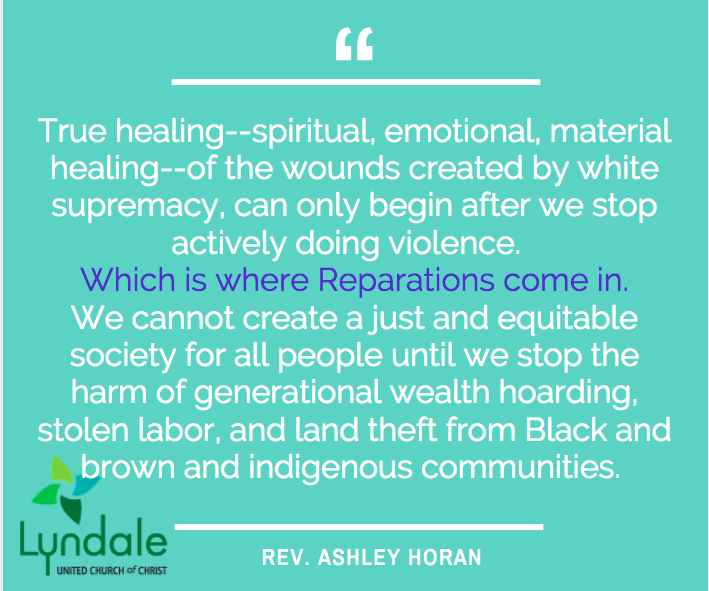 Those of us who work with MARCH want to invite you, Lyndale UCC, to enter into a deeper dialogue about Reparations, both internally and in community with other progressive, predominantly white congregations. And we want to invite you to make a commitment to becoming a CommunityWell congregation: mapping your human, infrastructural, and financial assets, and joining other faith communities in agreeing to share some of those assets with our local justice organizers who need them to lead us all toward collective liberation. I know that you’ve been having a congregation-wide look at how whiteness shows up in your collective life, and as a result have been looking for ways to move forward into deeper relationship, repair, and healing. And this invitation is one way to do that. We’ll be having conversations over the coming days and weeks with your leadership, and I hope that you will push yourselves to say yes. I’m going to stay tuned. It is time, my friends, for a reckoning that will lead us to spiritual renewal–and toward Reparation of what has been wrong so that Healing can usher in what can be right. We can and should advocate for mass-scale movement in this direction–but in the meantime, we can begin doing what we can, where we are, with what we have. We can be the “anybodys” who move together, bit by bit, until everybody is whole and free and well. May the Reparation lead to healing for us all. Blessed be, Ashé, and Amen.